Catch up with #3 here. Today started SUPER early, 5:30am kind of early. Today was a day we had been really excited about but in which I was also slightly dreading. We were off on a day trip to Washington DC (amazing right?) BUT it was a 4 hour coach trip each way and I am prone to getting travel sick (not so amazing). But even though I felt a little panicky I thought to myself... shut up and get on with it! We found the seats near the back with the extra leg room - we always have to get them and I was happy that the coach wasn't at full capacity. We were the only British people on board, mostly other American's and the rest German or Spanish or something or other ... we'll say European! I wish I could remember our tour guides name but I just can't but nevertheless - he was great. We left New York City and he was off - telling us so many facts and stories we couldn't keep up. New Jersey was a funny one as I think he probably said the words "New Jersey" at least 58 times in one part of his speech, ever other word was "New Jersey". It was so nice having someone to listen too as we drove through all the states and aswell as distracting me from the fact we were stuck on this coach for hours I was actually learning some pretty interesting information aswell. After a couple of hours we stopped off in Delaware and I couldn't believe we were half way already - it was 9am and it had gone so so quickly! Me & my friend grabbed some food and had a quick toliet break before we had to get back on the coach again. A lot of tree's and freeways later and we saw it, a sign saying 'Washington' we knew it wasn't far away and we were so excited to go and see all the tourist attractions! 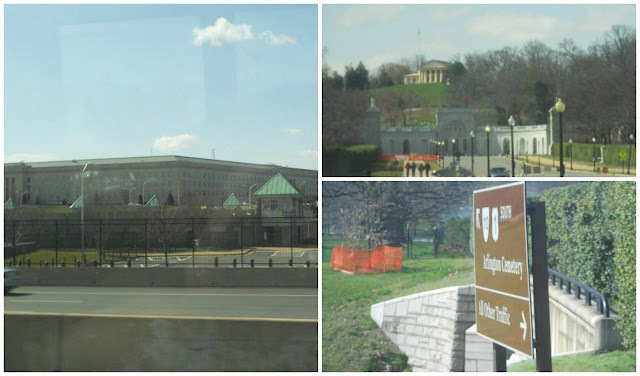 We drove past the Pentagon and Arlington Cemetery and the tour guide did give us some of the basic information on them but unfortunately we weren't able to stop off at them, but got got a couple of snaps anyway! From the memorial aswell you can also see the Washington Monument but that was actually closed off for repairs! 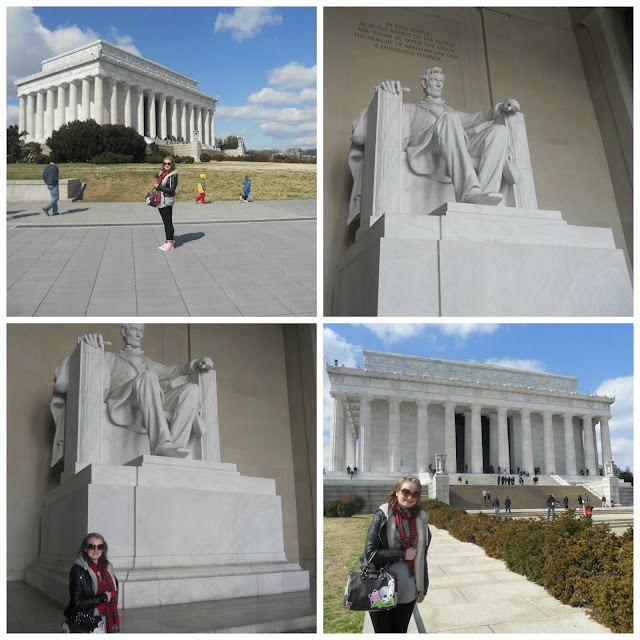 After taking in the Lincoln Memorial we headed back down the steps and across the park to the Korean War Memorial which the tour guide had also advised us to do. Had a really embarassing moment when my scarf blew off and into the memorial! Lucky someone found it and came and gave it back to me .... it was really windy! Back on the coach now and our next stop was... The White House! Earlier on in the day the guide had informed us that alot of the time you can go right upto by the fence and get some really good up close photos, but other times you can't get anywhere near it.... guess which time it was for us? Yup there were police surrounding it! Although it did make it a bit more exciting as we knew The President was in there and apparently having a meeting! The police were very strict (obviously) and even one step off of the grass we were on and they had the megaphone out and asking us to move back - which really mademe jump! We didn't stay there too long and then we were on the coach again and heading to a gift shop. (I'll cut to the chase now.... it was crap!) 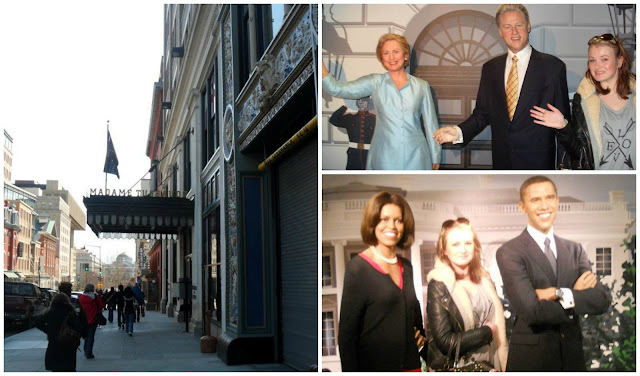 We both grabbed a few postcards and a snack and got back on the coach knowing our next sop would be a funny one - Madame Tussauds. This MT features mainly waxworks of previous presidents and obviously there are celebrity statue there aswell! From what I remember we didn't have much time there but it was fun! There was a set up of The Presidents office with a professional photographer which ended up being hilarious - he got my friend on top of the desk lying down and pretending to answer the phone, thank god I didn't have to do that! 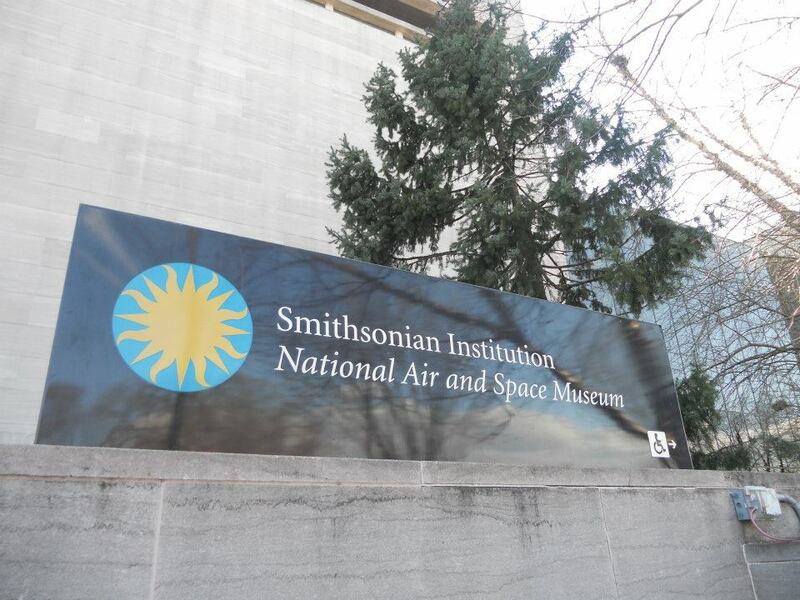 Next stop on out whirlwind trip around Washington DC was the Smithsonian National Air and Space Museum. This is huge museum and I really loved it. It was so so interesting, especially all the space and universe stuff (because I'm a geek like that! ), there was so much to see and do and I would 100% recommend it to anyone who is in the area, it was fantastic. While we were here aswell we made sure we had some lunch/dinner and being healthy as ever we had.... MacDonalds, because what museum is not complete without a Maci D's inside?! After this we were all off to our last stop of the day - The Capitol Building ( is the meeting place of the U.S. Congress, the legislature of the U.S. federal government.) This was super fun as it was all outside and we got to have a bit of time out in the sunshine (even though it was still a little chilly!) After getting some photos with the famous building me and my friend stretched our legs out on the grass in front and then went and had a chat with the tour guide. Of course we were talking about the UK and he was telling us all the stuff he'd watched on TV from us, including Fawlty Towers (one of my favourite shows!). 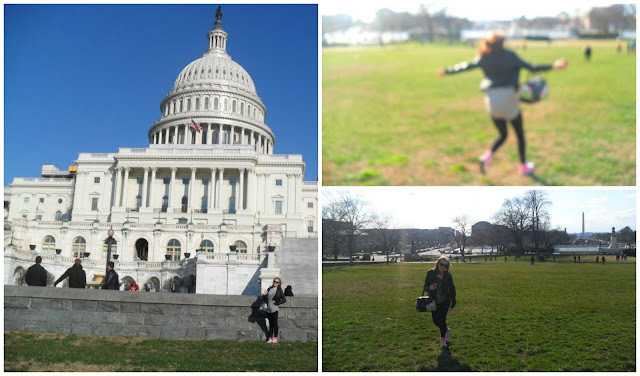 So now it was time to say goodbye to Washington DC and head back to New York City and our hotel! 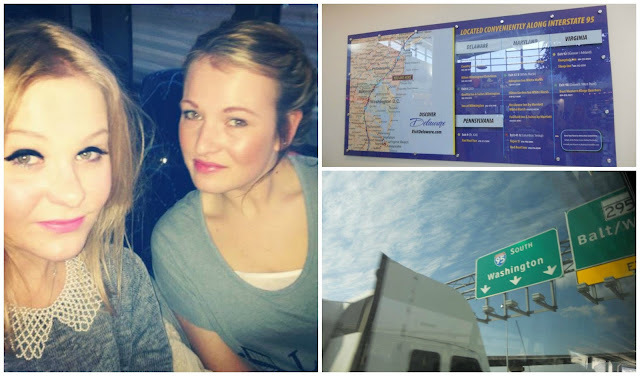 The coach journey again went super quick (never been so grateful for anything in my life!) we stopped off at the same service station in Delaware again and got some snacks, by this time it was really dark and we were starting to get really sleepy! The tour guides (yeah there was two of them.... forgot to mention that part but the other one was an english translator!) at this point put on a DVD for all of us to watch. This was a film we had both never head of called Old Dogs starring Robin Williams and John Travolta and beacuse it was getting so late we both fell asleep before the end... I still don't know what happened! New York City just minutes away we got the option, to be dropped off at Times Square or back at Grand Central Station! Obviously we picked Times Square as it was closer and made the trek back to our hotel and thankfully to bed! NEXT POST - SOHO, SPENDING & SERENDIPITY 3 - our last day in NYC for now. Washington DC is awesome, really pretty in April when all the Cherry trees are in full bloom.